From the Department of Neurology (I.K.S., A.N., R.B., Y.B. ), Department of Neuroscience (Y.Z., P.C. ), and Department of Genetics & Genomic Sciences, Icahn Institute for Genomics & Multiscale Biology (J.C.C. ), Icahn School of Medicine at Mount Sinai; Department of Neurology (E.C., E.C.-H., S.S., B.A.C.C., S.E.B. ), Weill Institute for Neurosciences, University of California, San Francisco; E.C. is now with Universities Space Research Association, Space Biosciences Division, NASA Ames Research Center, Moffett Field, CA; Department of Pediatrics (J.D., R.K.), Department of Computer Science & Engineering (R.K.), and Center for Microbiome Innovation (R.K.), University of California, San Diego; and Neuroscience Initiative (P.C. ), Advanced Research Science Center at the Graduate Center of the City University of New York. (A and B) Rarefaction curves plotting alpha diversity indices (A: Observed_species; B: Chao1) vs the number of sequences for each treatment group. n.s. : not statistically significant by the Kruskal-Wallis sum-rank test. (C) Principal coordinate plot based on the unweighted UniFrac distance metric. The percentage of variability explained by the first 3 principal components was plotted. Each colored point represents a participant from one of the therapy groups (Naive, DMF, or GA). (D) No obvious beta diversity differences were observed across groups as demonstrated by similar within-group and between-group distances. n.s. : not statistically significant by a non–parametric 2-sample t-test based on 1,000 Monte Carlo permutations, followed by a Bonferroni correction for multiple testing. 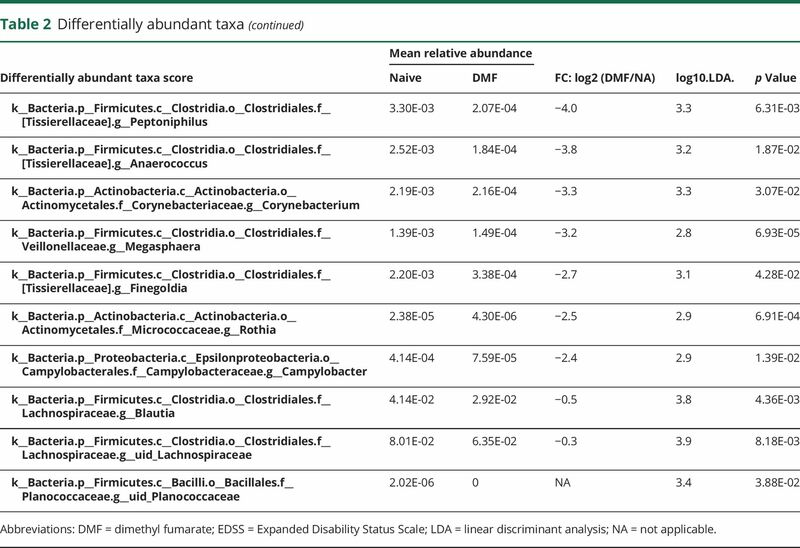 (E) Mean relative abundance of prevalent microbes (>1% in any therapy group) at the phylum level. 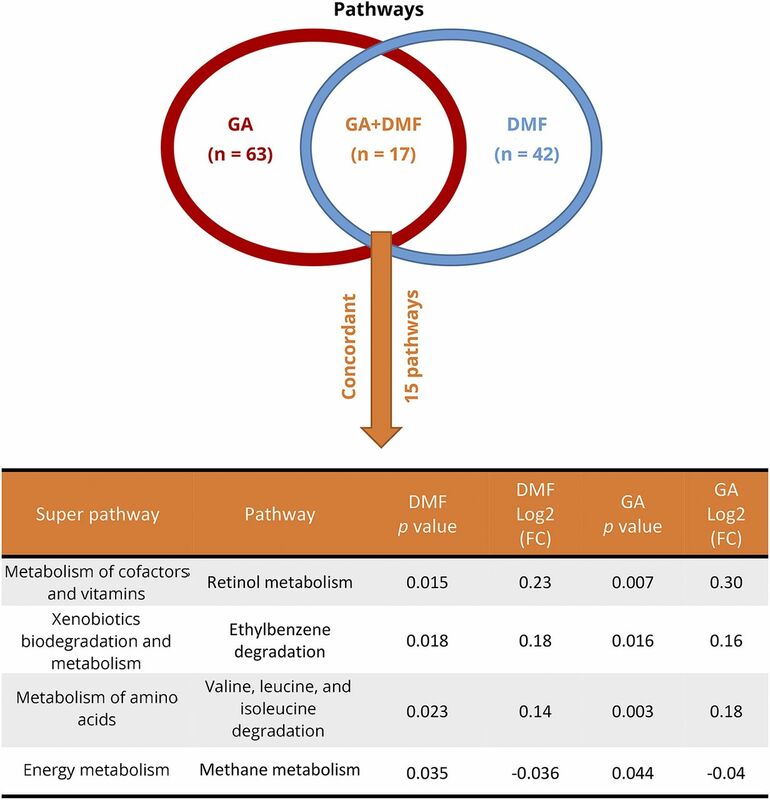 DMF = dimethyl fumarate; GA = glatiramer acetate; k = kingdom; p = phylum. Upper: DMF vs Naive. Lower: GA vs Naive. 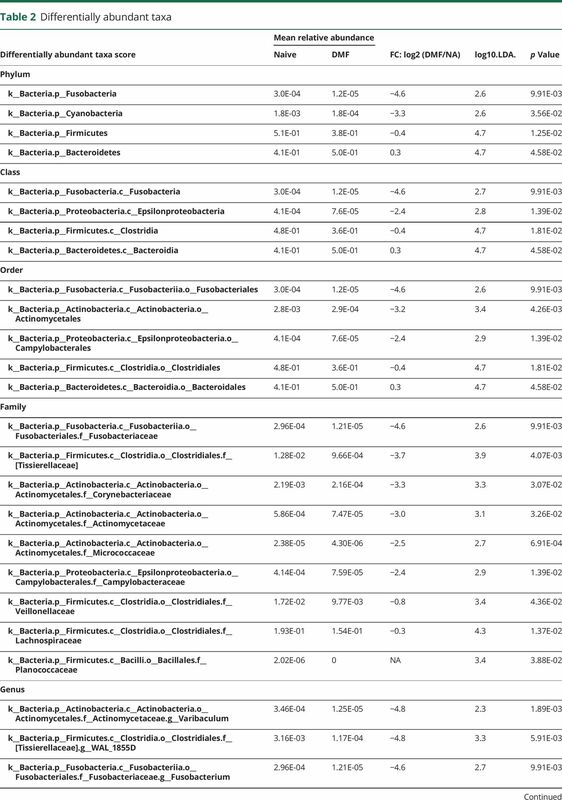 Only significant taxa (p-value < 0.05, LDA score >2) identified by LEfSe were displayed. Differential abundant taxa are marked by colored shades: red indicates enrichment in the therapy groups (DMF or GA), and green indicates enrichment in the naive group. Circles represent phylogenetic levels from kingdom to genus from inside out. Each dot represents a taxon and its diameter is proportional to the taxon's effect size. 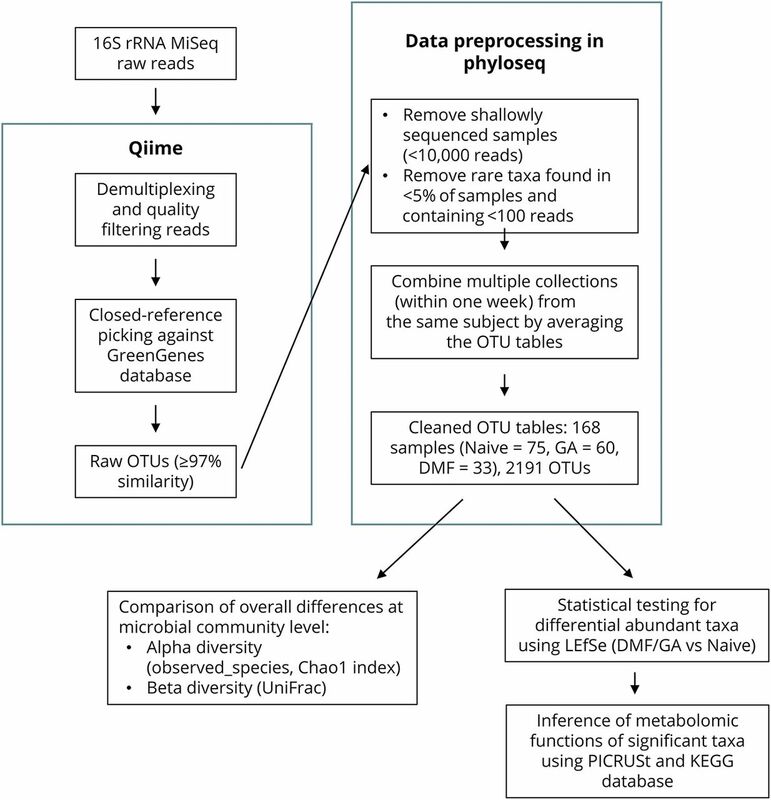 c = class; DMF = dimethyl fumarate; f = family; g = genus; GA = glatiramer acetate; k = kingdom; LEfSe = linear discriminant analysis effect size; LDA = linear discriminant analysis; o = order; p = phylum; uid = unidentified, according to the GreenGenes database. 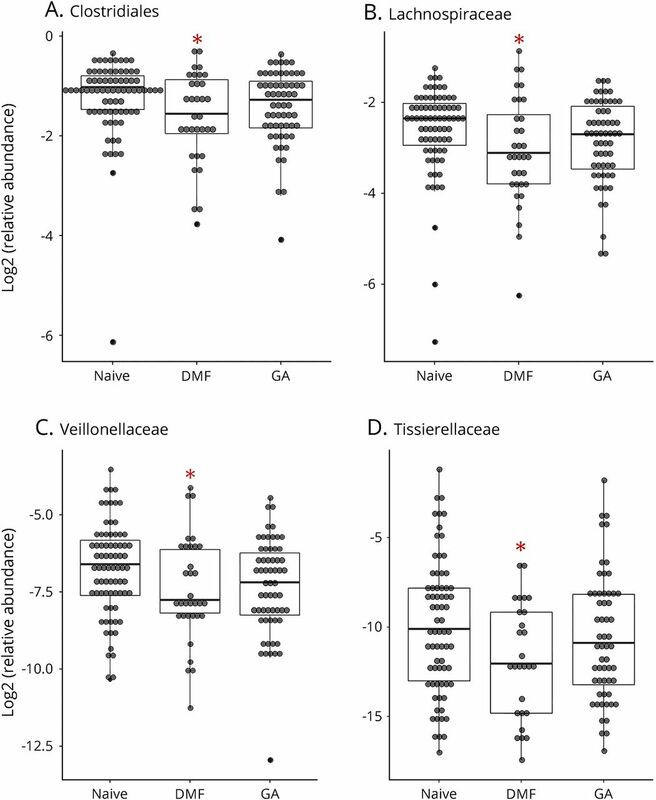 Relative abundances of the order Clostridiales (A) and its family members are differentially changed by therapies (B: Lachnospiraceae; C: Veillonellaceae; D: Tissierellaceare). Asterisk (*) indicates significant change compared with naive as determined by the LEfSe analysis (see also in table 2). The inner bisecting line indicates the median. The lower and upper edges of the box represent the 25th and the 75th percentiles, respectively. LEfSe = linear discriminant analysis effect size. 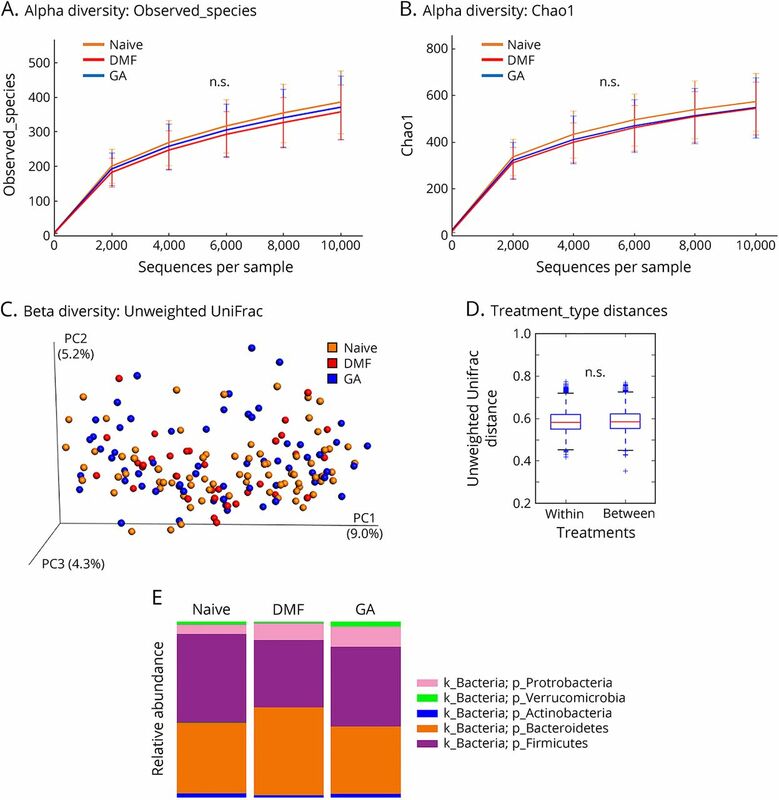 Functional implications of the gut microbial profile changes were assessed by applying the package phylogenetic investigation of communities by reconstruction of unobserved states on whole microbial communities of patients taking either GA or DMF. Forty-two pathways were found to be affected in participants treated with DMF (30 upregulated and 12 downregulated) and 63 pathways in participants treated with GA (36 upregulated and 27 downregulated). 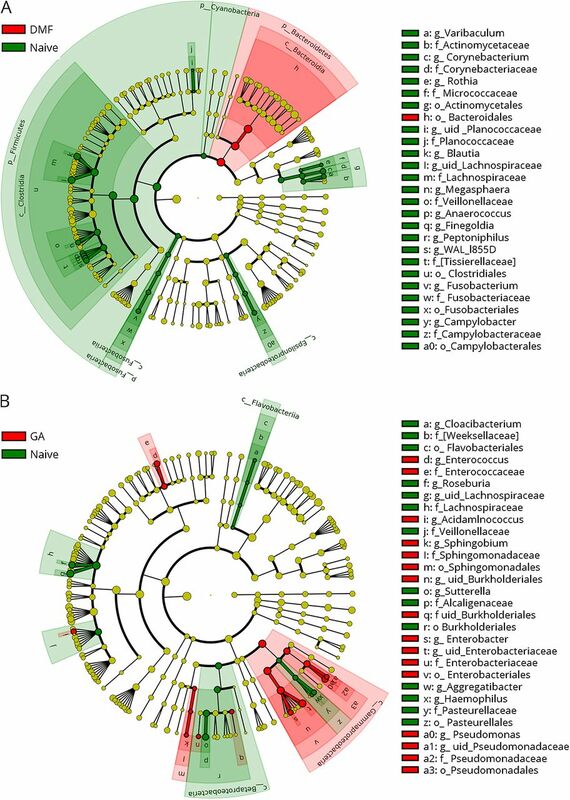 Despite the different route of administration and the different effect on bacterial taxa, there was an overlap of 17 pathways that were changed by both therapies, 15 of which had a concordant effect. These included pathways of vitamins, amino acids, energy and xenobiotic metabolism, and more specifically the metabolism of retinol (vitamin A), methane, and ethylbenzene, as well as valine, leucine, and isoleucine degradation. DMF = dimethyl fumarate; GA = glatiramer acetate.